Soup is the perfect comfort food on these cold winter days. 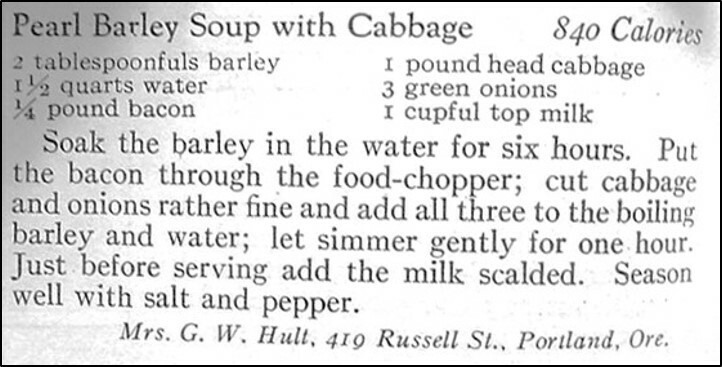 I recently found a wonderful hundred-year-old recipe for Pearl Barley Soup with Cabbage. The soup was delightful – but the recipe name is misleading. 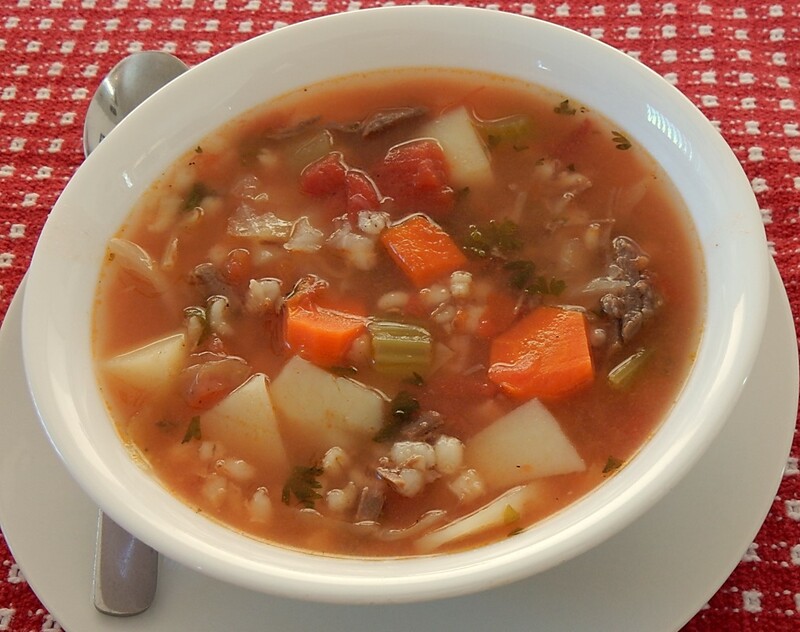 The recipe only calls for two tablespoons of barley – and it is not a predominate ingredient in the soup. 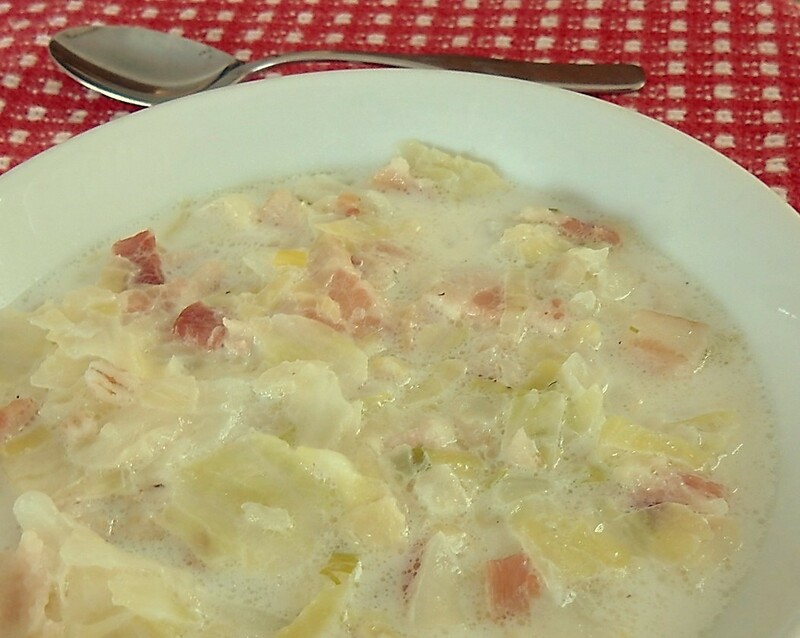 This soup is really a hearty, rustic Cabbage and Bacon soup. Put water in a dutch oven; bring to a boil using high heat, then add barley, bacon, cabbage, and green onions. Return to a boil, then reduce heat and gently simmer for 1 hour. Add half and half, salt, and pepper. Heat until steamy hot, then serve. Vegetable Chowder with Meat is the ultimate comfort food. 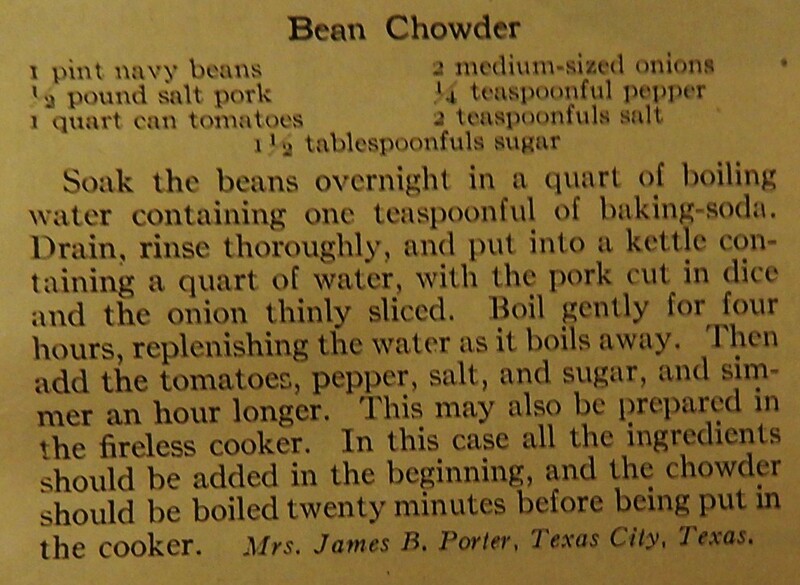 This hundred-year-old recipe makes a delicious hearty soup that is perfect on these cold winter days. This flavorful soup features carrots, potatoes, cabbage, tomatoes, onion, and celery, as well as a little barley. I used beef in this recipe, though other meats would also work. Put the meat and water in a stewing pot or dutch oven. Cover and bring to a boil using high heat, reduce heat to medium and simmer for one hour. Add barley and cook for an additional half hour. Add carrots, potatoes, cabbage, onions, celery, and tomatoes. Continue cooking for an additional hour. Add salt, pepper, and parsley. Remove the meat from the pot and cut into bite-sized pieces. Return the meat to the pot. Reheat until the soup is hot, and then serve. When it comes to cooking, March is the month I find most challenging. Many days the weather is still brisk and windy (with an occasional snow shower) – and winter foods seem most appropriate, yet I’m tiring of them and yearn for bright and sunny spring foods. 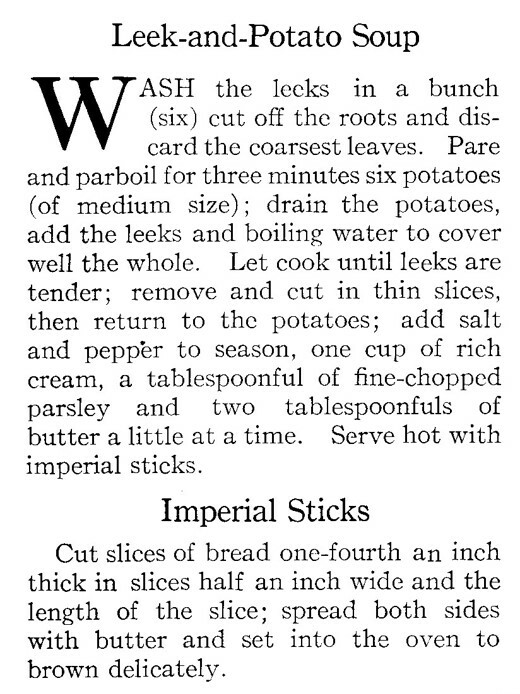 When I searched for the perfect hundred-year-old recipe for this week, I came across a recipe for Leek and Potato Soup with Imperial Bread Sticks that excited me. The verdict: The Leek and Potato Soup was easy to make, and delightful; and, just right on a damp and raw March day. 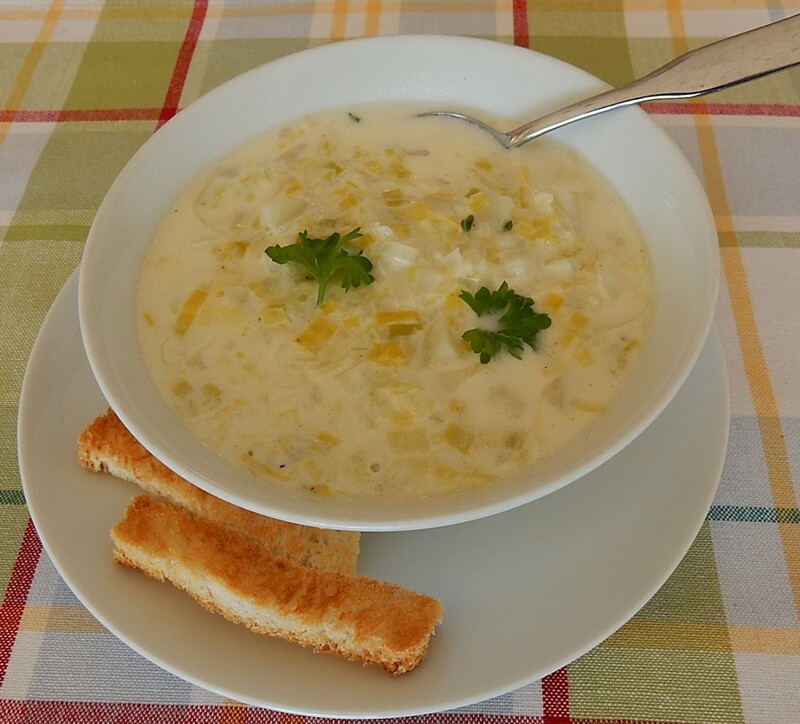 The traditional combination of leeks and potatoes in a rich and creamy soup base warmed me, and delicate yellow and green leek pieces floating in the soup provided just a hint of spring. The recipe called for serving the soup with Imperial Bread Sticks. The bread sticks were made by cutting bread into sticks and toasting. It was fun to replicate how people made bread sticks a hundred years ago – though it I made this soup again, I’d probably either serve it with a warm artisan bread or buy modern bread sticks. Clean the leeks and remove the coarse dark green tops. Cut the white and light-green portions of the leeks into thin slices. Set aside. Peel the potatoes and cut into 1/2 inch cubes. Put the diced potatoes in a large saucepan and cover with water. Put on the stove and using high heat bring to a boil; cover and reduce heat to medium. Cook for 3 minutes, then remove from heat and drain. Add the sliced leeks to the drained potatoes, and just barely cover with boiling water. (I heated the water in the microwave. In days gone by, it would have been heated in a tea kettle or pan on the stove.). Return to the stove, and using high heat bring to a boil. Reduce heat to medium and cover; cook until the leeks are tender (about 15 minutes). (DO NOT drain.) Stir in the salt, pepper, cream, parsley, and butter. Heat until the soup is hot and steamy. Remove from heat, and, if desired, serve with Imperial Bread Sticks. Cut as many slices of bread as desired into sticks 1/2 inch wide. Cut off the crust. Butter both sides of the bread sticks, and then place on a metal baking sheet. Place under the broiler and broil until lightly browned. Remove from oven and flip, then return to broiler to brown the other side. Remove from heat and serve. Notes: The process for preparing and cooking the leeks and potatoes in the old recipe was a bit befuddling. The potatoes (which I assume were diced into cubes) were boiled for three minutes, then the water was drained. Next the entire white and light green sections of the leeks were added to the saucepan, and everything was covered with boiling water. This mixture was then cooked until the leeks were tender – at which point, the leeks were removed from the water and thinly sliced; then returned to the water. When I updated the recipe I simplified the process just a little. Perhaps draining the potatoes after cooking them for several minutes removed excess starch, so I retained that step. And, perhaps pouring boiling water on the leeks and partially cooked potatoes (rather than covering them with cold water which is brought to a boil) affects the texture of the vegetables, so I retained that step. But, for the life of me, I couldn’t figure out why the leeks should be cooked before slicing. If seems like it would be much more difficult to slice cooked leeks than raw ones, so I simplified that step and sliced the raw leeks before adding them to the potatoes. It’s cold and blustery here – and time to make a hearty soup. 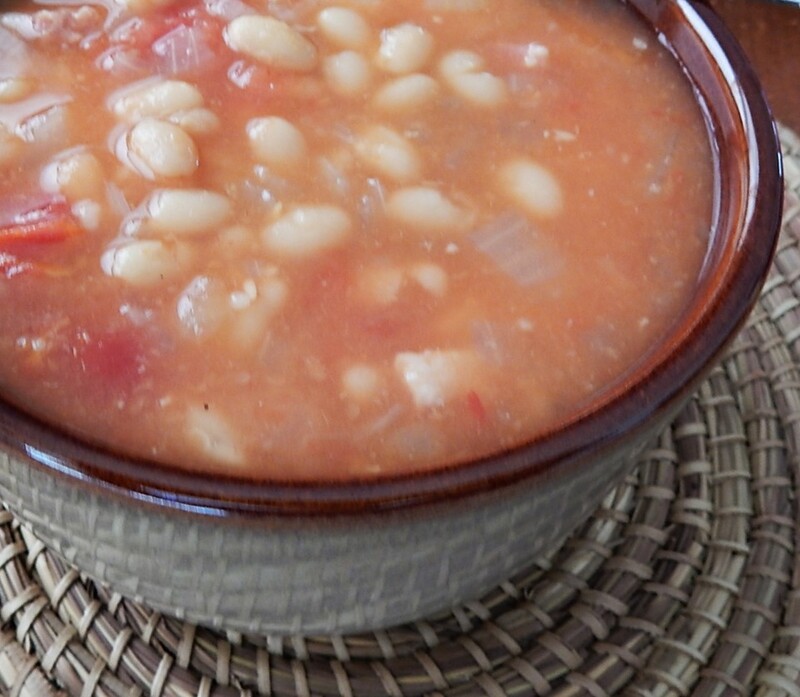 I searched though my hundred-year-old recipes and came up with the perfect soup for a cold winter day – Bean Chowder. This savory, comforting, filling and nutritious chowder is made with dried navy beans, salt pork, onions and tomatoes; and it hit the spot perfectly. This recipe is a keeper (though if I made it again I might shorten the prep time by using canned navy beans). In a large saucepan bring 1 quart water and the baking soda to a boil using high heat. Remove from the heat, then stir in the navy beans, and cover. Let sit overnight (10-12 hours). Then drain the beans. Rinse thoroughly and then put into a large dutch oven or soup pot. Add one quart water, the diced salt pork, and the onions. Bring to a boil on high heat, and then reduce heat and let gently simmer for four hours. Add additional water as needed (approximately one additional quart of water will need to be added). At the end of the four hours, add the tomatoes, salt, pepper, and sugar. Cook for an additional hour, and then serve. Each week I browse through hundred-year-old magazines and cookbooks in search of the perfect recipe to feature. Occasionally a reader’s comment provides the inspiration for the recipe I select. Today was one of those times. 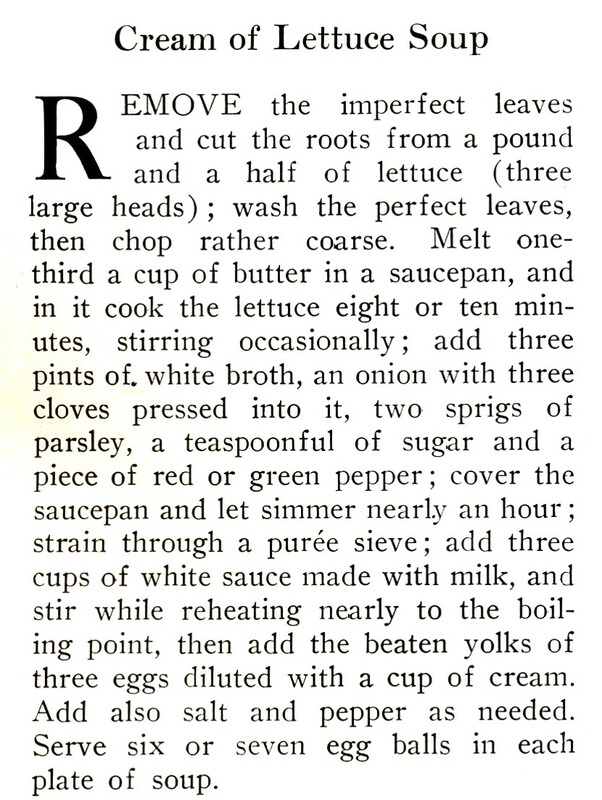 As for the lettuce soup – it was quite common in classic French cuisine. It’s interesting that it somehow lost popularity. I wonder why. I still use it in certain soups. It adds lots of body and creaminess without making the soup heavy. . . Ever since then I’ve had this urge to make a hundred-year-old lettuce soup recipe, and when I saw some awesome leaf lettuce for sale this week, I knew that now was the time to give it a try. The Lettuce Soup turned out wonderfully, and was good either hot or cold. 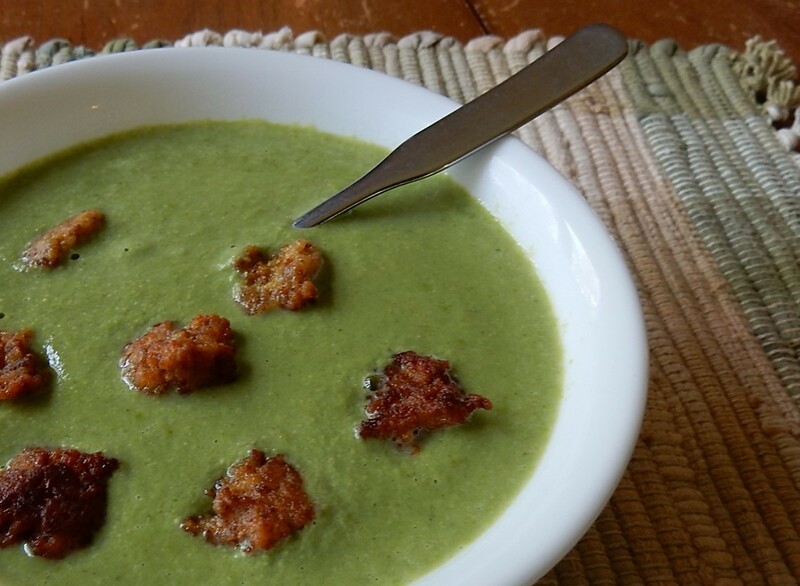 This nutrient rich soup contains several vegetables which results in a lovely, nuanced combination of flavors that beautifully combine the mild bitterness of the lettuce with the slight tanginess of onions and green pepper. It is lovely when served hot with small, delicate Egg Balls. Melt butter in large sauce pan. Add the chopped lettuce, and cook using medium heat until the lettuce is wilted, while stirring occasionally (8-10 minutes). Add the chicken broth, onion, green pepper, parsley, cloves, and sugar; cover the saucepan and simmer for 20 minutes. Remove from heat and cool slightly; then puree using a blender or food processor. Return the pureed mixture to the pan. In a mixing bowl, stir the egg yolk into the flour, then add a small amount of milk and stir to create a paste. Gradually add the remaining milk and cream while stirring to create a smooth sauce. Then stir the sauce into pureed lettuce mixture. Heat mixture until hot and steamy using medium heat; stir occasionally. May be served either hot or chilled. If desired, serve with Egg Balls. Combine bread crumbs and egg yolk in a bowl. Shape the mixture into 1/2-inch balls. Place the clarified butter or shortening into a frying pan, and heat until hot. Drop balls into the hot butter, then gently roll the balls with a fork until all sides are a light brown. Remove from heat and drain on paper towels. 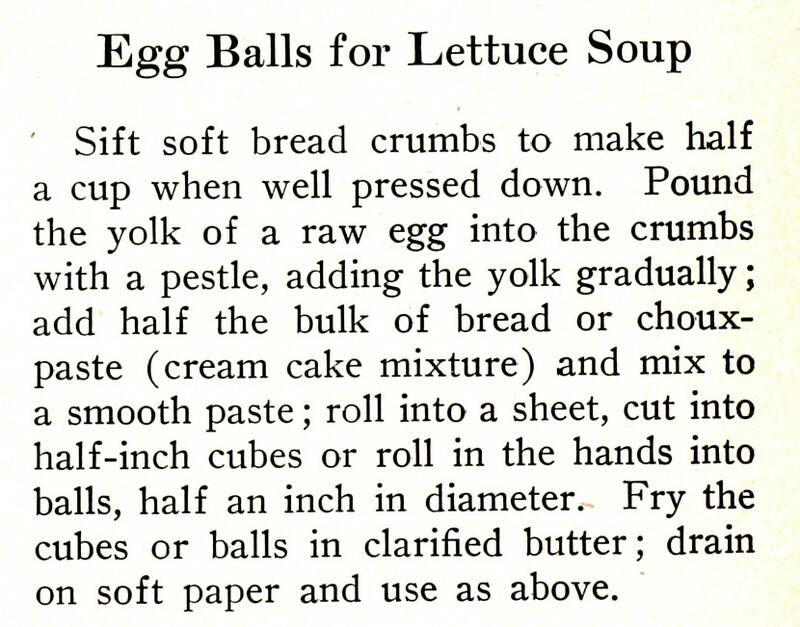 Put several egg balls into each cup of Lettuce Soup. The original Lettuce Soup recipe made 12 or more servings, so when I adapted the recipes for modern cooks, I divided the soup ingredients by 3. The Egg Balls recipe did not seem overly large, so I did not need to make a similar adaptations to that recipe; however, I used one fewer egg yolk in the Egg Balls than called for in the original recipe because the consistency of the dough was better. One of my New Year’s resolutions is to lose a few pounds. 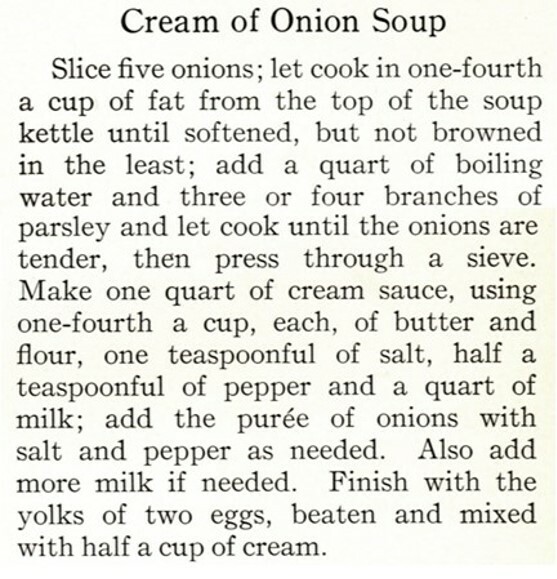 I’m trying to eat healthy (and January is the perfect time for soup), so I looked through my hundred year-old cookbooks for a soup that was light yet rich and tasty. I wasn’t sure it was possible to find a soup that met my criteria, but I think that I came up with a soup that fits the bill. 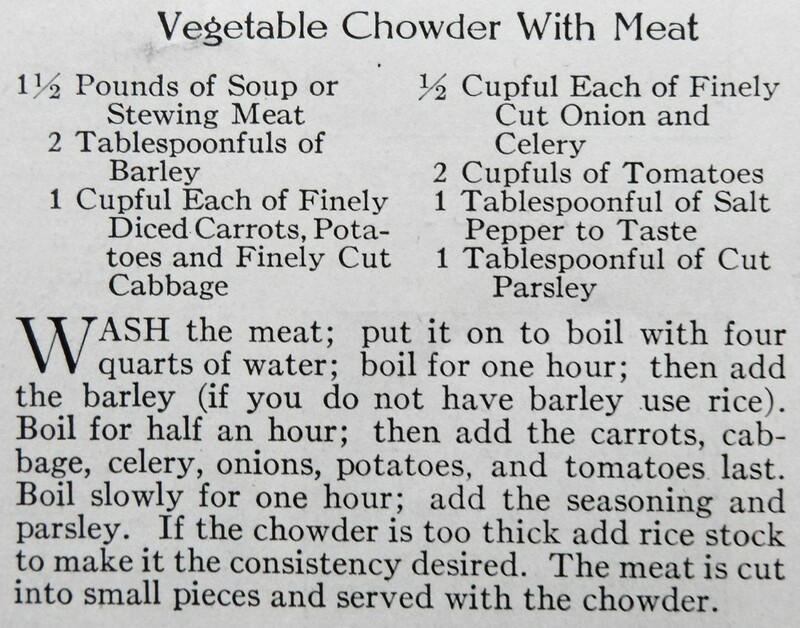 I found a recipe for Cauliflower Soup in Lowney’s Cook Book (1912). 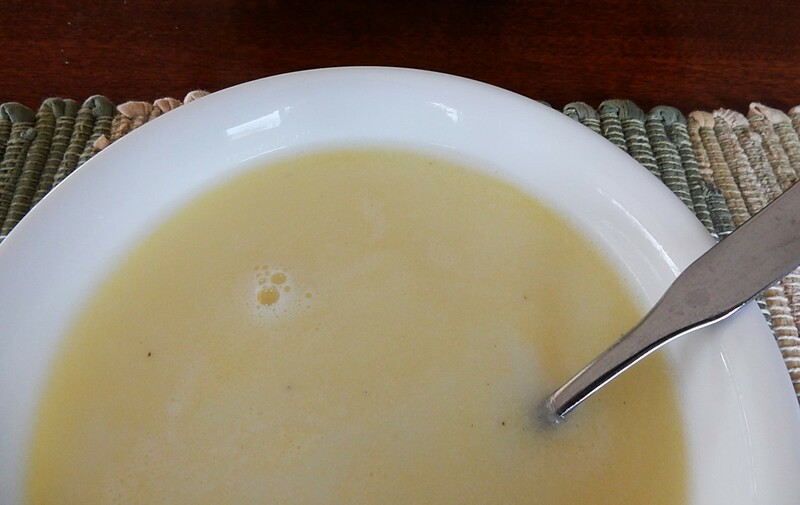 This milk-based soup is a very smooth, strained soup—and not very thick; so I think that today it would be considered a “silky” soup. 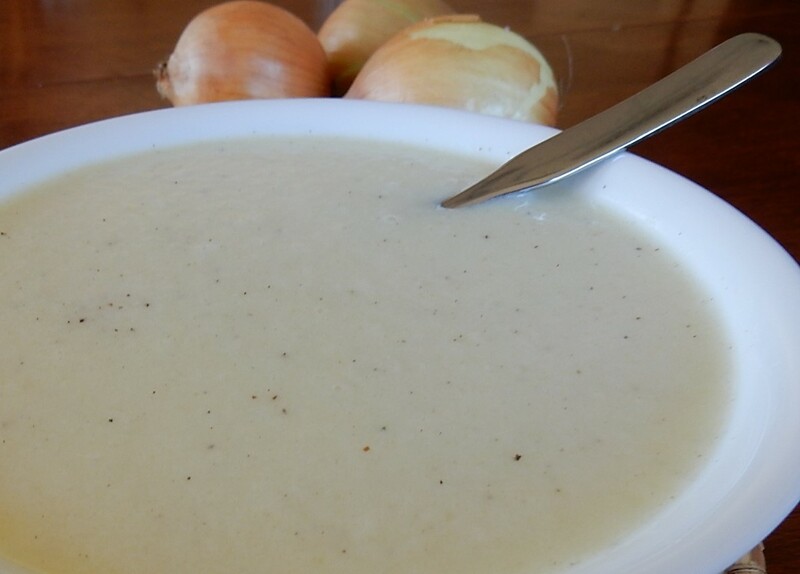 This Silky Cauliflower Soup is lovely, and has a surprisingly subtle cauliflower taste. The soup will warm you up on a cold winter day–plus, it’s light enough that you don’t need to feel guilty. Put chopped cauliflower in a saucepan and cover with water, bring to a boil and cook until tender. Drain cooked cauliflower and puree in a blender or food processor. In the meantime, melt butter in a large saucepan; then add the chopped onions and saute until tender. Stir in the flour, and slowly add 3 cups water while stirring constantly. Stir the egg yolk into the remaining 1 cup water; and then add the egg and water mixture to contents of the large sauce pan while continuing to stir constantly. Add the pureed cauliflower, salt, and pepper to the mixture and bring to a boil. Remove from heat and strain. Return the liquid to the pan and stir in the milk. Heat until hot, then stir in the Parmesan cheese and serve.